That’s deep, if you’re talking about a dog’s point of view on life. 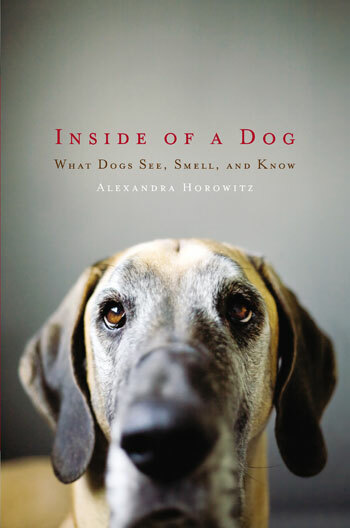 (For one of the best books ever written on the canine umwelt, check out Alexandra Horowitz’s Inside of a Dog.) But for our purposes, I’m talking in literal terms. What are dogs’ actual eyeballs taking in, specifically in terms of colors? Are they colorblind, like some say? Do they see in black and white? What about ultraviolet light? Let’s look at a real-life case. In my dog training class last night, students taught their dogs to touch their nose to a Post-It note. You might wonder: Why ask a dog to put its nose on a piece of paper? Why a sticky piece of paper? What color is the paper? To which I’d respond: If your dog can touch a target, like a Post-It, then he can learn to touch it wherever you hold it. If it’s sticky, you can attach it to something–a wall, say–and let go. Service dogs, for example, can be taught to flick light switches on and off using this method. Oh, and the color of the paper? Yellow. Does that seem random? Irrelevant? Consider this: Dogs’ eyes are equipped with cones (color receptors) for perceiving yellows and blues, but not reds. (This is typical of other non-human mammals.) I so don’t want to get into the anatomy, physiology and neurobiology of the visual system; I can barely comprehend it, much less explain it. Let’s stick with this: Dogs see red (and orange and pink), as shades of gray. And greens look pretty much like reds–as they do to the 8% of humans (mostly male) who are red-green colorblind. 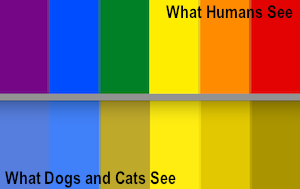 The image above contrasts how humans see the visible spectrum with how it looks to dogs. See how the yellow stands out amidst the drabness? 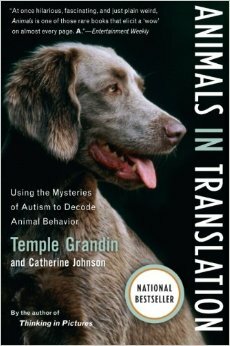 In her superb book Animals in Translation, Temple Grandin describes cows who refused to walk up a ramp with a yellow rain slicker draped over the railing, and who avoided a building with a yellow ladder propped against it. She intuits that the cows were spooked by the high color contrast between the yellow objects and their surroundings. For “dichromatic” animals (those that see in two colors rather than three), color contrasts can be distracting or frightening. “Anything yellow will really pop out at them,” Grandin explains. I don’t use yellow sticky notes to distract or scare dogs; I just picked the easiest color for targeting because it “pops out”. Likewise, I always buy yellow tennis balls for my dog, because I assume they’re easier to track in the air and on the ground. Pet stores sell tons of red, pink, orange, and green dog toys, which look bright and cheery to us, but to a dog, their murky hues make them easy to lose against any greenish, reddish, brownish or grayish background. Does a dog’s-eye view seem a little dreary compared to ours? Before we get too smug, let’s remember that dogs’ primary sense is smell, and scent must form an olfactory tapestry that’s vibrant beyond our imagination. Plus, dogs’ crappy color vision still has ours beat in one regard: They see UV. Let’s review: Dogs have cones for yellows and blues. Humans have an additional type for reds. 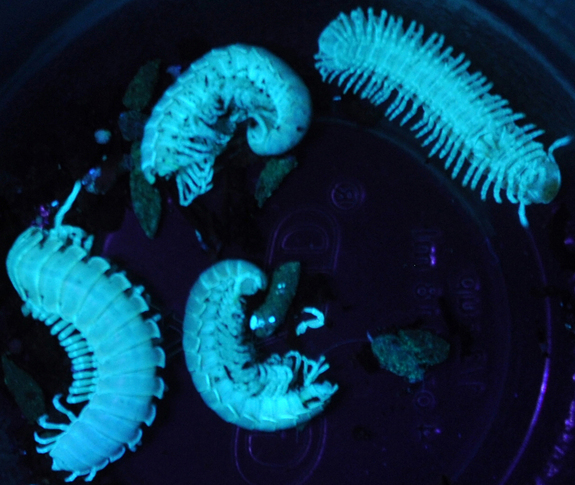 Plenty of birds and bugs have a fourth type of cone that is sensitive to ultraviolet light. Even without these cones, our retinas could receive some UV light if the lenses of our eyes weren’t specially designed to block it out. Scientists figured this shielding feature was shared by non-human mammals. Guess what? When two British scientists shone light through the eyeballs of a wide assortment of dead mammals, they discovered a lot of them–from hedgehogs to okapis to, yes, dogs–have lenses that let some UV light penetrate to the retina. That means things that glow for us under a black light look a bit glow-y to a dog in normal light, for example snow and pee. A snowman that’s been urine-marked by every pup on the block could be a lurid spectacle indeed. What else must look weird to them? When has your dog had a weird reaction to something that looked normal to you? Or overlooked something you thought was plain as day? Do you think color perception might have something to do with it? < Previous What counts as play? Next > Crows Bring Bling-Bling! Lovely article on the how our canine compadres see the world! Thanks! Wouldn’t it be fun if someone made glasses that would allow you to see like a dog? Could be an idea for Shark Tank (http://abc.go.com/shows/shark-tank)! My pleasure. Thank you for such a lovely, detailed post! The glasses are a fantastic idea. I can’t believe someone hasn’t come up with that and produced it! Perhaps because it’s your calling (wink)? Really liked your post. Great information about how dogs see colors.